Explorez le Duomo de Milan avec cette visite guidée de 3 heures de la cave, de la cathédrale et du toit avec un petit groupe. Découvrez les traces d'une ancienne église sous le Duomo et admirez la vue fantastique sur les toits de la ville depuis les terrasses. Découvrez les histoires qui se cachent derrière la piste du cadran solaire, le rituel du Holy Nail et les sculptures d'animaux et de monstres étranges tout en explorant l'intérieur et les terrains du monument. Terminez votre journée avec un café italien ou un gelato. Remarque: Un code vestimentaire doit être suivi pour entrer dans le monument. Absolutely wonderful small-group tour of the Duomo, including the terraces and underground. Deborah was amazing, knowledgeable and engaging, and she simply made the visit incredible. Highly recommend! Local guide terrific. We had all the access skipping the lines, fantastic. Perfect way to see the Duomo. Our guide was spectacular! Very personable and spoke at a level we all were enthralled with. The guide really makes the experience memorable. This was a great way to see the Duomo highlights, spaces I wouldn't have paid attention to otherwise and of course the Roof top. Skipping the line was a MAJOR plus to this tour. Paulo was an excellent guide. Very knowledgeable, very kind and he added some humor which always makes for a great tour. Would definitely recommend this. I never felt rushed on taking pictures like on some tours. A great tour, and a great guide - Debora/Debi! Just 3 of us, so we had the guide pretty much to ourselves. Very interesting walk underground, in the cathedral and a long walk around at the terrace. Couldn't be better.! How much more intimate can you get to know a church when your inside, and on top of it?! Make no mistake, it will take EFFORT to get to the very top and those with mobility problems might want to think before booking this tour. But the reward is breathtaking! 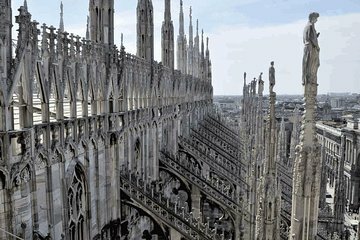 To see the details of the Flying buttresses, the statues precariously perched on the steeples, the panoramic view of Milan, to sit at the very top and look and walk at the very bottom of the church was just amazing. The inside of the Duomo was just as awe inspiring as well. It's only way to experience this gem of Milan. My favorite part of this tour was the terrace. We did a longer tour the day before that included the Duomo, but with this tour we got to spend more time in the Duomo and got to go underground and on the terrace. The view from the terrace was breathtaking. Plus it was just us and one other couple so the guide was able to answer our questions and talk directly to us no headphones!. The tour was fantastic and our tour guide was amazing! Had a great time, so informative and really enjoyable. Our tour guide (sorry, can't remember her name) even gave us some pointers on where to go in the evening for food and drink, very helpful and nice of her. Thanks very much. Our tour guide was wonderful! Would highly recommend this service.